Remember how much you enjoyed watching The Revival in NXT, and dreaded them being called up to the main roster? If these rumours are indeed true, then your fears have come to pass. The Revival will be placed in the 'Ascension spot' at WWE RAW 25, according to Cageside Seats. We shall elaborate on what this means in the section that follows. Cast your mind back to the RAW reunion show in 2015. The nWo was in the middle of the ring cutting a promo when they were interrupted rudely by The Ascension. JBL would rise from his commentary desk, and reunite with his old friend Faarooq, to reform the APA for one night only. In mere moments, they would be joined by the New Age Outlaws, as the legends took turns in taking out The Ascension. Many have dubbed The Revival the best tag team of the modern era, because of their immense in-ring prowess. Their matches in NXT have caught the eye of legends such as Stone Cold Steve Austin and Jim Cornette. Sadly, the rumours indicate that they will be taken out by the legends at RAW 25. This ties right into the promo they cut last week, where they took cheap shots at the returning legends. 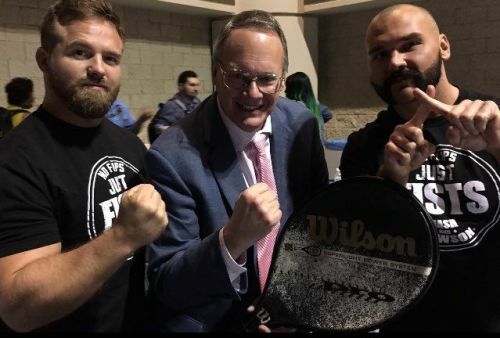 If so, The Revival's main roster momentum may be stalled, even before it really begins. RAW 25 is only a few hours away, and Sportskeeda will have live coverage of the same, as the action unfolds on screen. I'm a really big fan of The Revival, and I don't want to see them get squashed on RAW 25. If anything, I wouldn't mind them putting the hurt on a legendary tag team to get heel heat. Here's crossing my fingers and hoping for the best for action that follows.